I'm still working on my Beauty and the Beast characters and hope to have the table preview to show the girls ready by this weekend. It's going to be a BUSY week here in Candyland, so I hope I can get it all done on schedule as I still have 17 other Disney tables to get moving on for the Young Women's camp fundraiser next month. 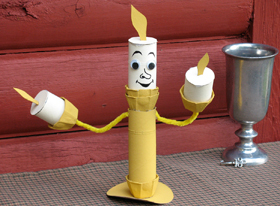 I plan to make this Lumiere toilet paper roll Candelabrum for the table, but I haven't collected all the Toilet Paper rolls that I need yet. I asked the girls to start saving me some since I have a few projects for the tables that I will need them for, but we haven't gotten there yet. So I am sharing the directions from Disney Family.com. If you're interested they also have other ideas to help with a Beauty and the Beast birthday party there including another version of how to make Chip the Teacup (using Modeling Magic) if you didn't like my Chip free printable version.